Sealed closed dome head aluminium/steel blind rivets. Drill out the old ones with 5mm drill and fit these with a pop riveter. If the shape of the catch block prevents the riveter from making close contact with the rivet head put a couple of washers eg M4 over the rivet shaft between the rivet head and the riveter. A4 grade stainless steel nyloc nuts and nylon spacers to replace the chromed-brass originals which often suffer from electrolytic corrosion. Complete with M6 threaded screws and washers. 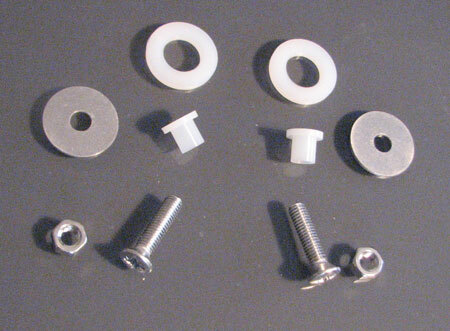 Please note that the new nuts have metric threads and cannot be used with the original screws. 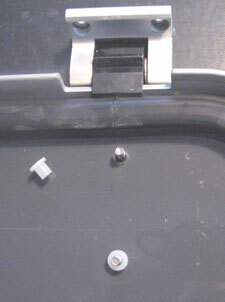 The fixings above are for early model hatches where the strap hinge is fixed to the acrylic. The more modern hatches have their own problems, usually with the hinge pins. Click the link to the factsheet for more information. If you are unsure which model hatch you have click the link to the Lewmar website. The Lewmar website will give you details of your nearest stockist. 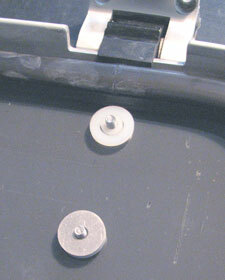 Press stud fixings for sprayhoods and canopies often found on aluminium frames. Make your own corner brackets for aluminium frames etc. For some strange reason this comes from the mill in inch sizes except the length which is in metres. Not anodised. Will be supplied cut into half metre lengths for ease of postage unless your request otherwise.